This is just a perfect place to end your all-natural day. Back to nature is indeed the key to all our facilities here. Bathrooms are made of stone and the water is unbelievably fresh. We also serve natural food-baked, fried, roasted, anyway you like it - with no preservatives. Sleep the night away as the crickets sing you a lullaby and wake up in the morning feeling incredibly refreshed. 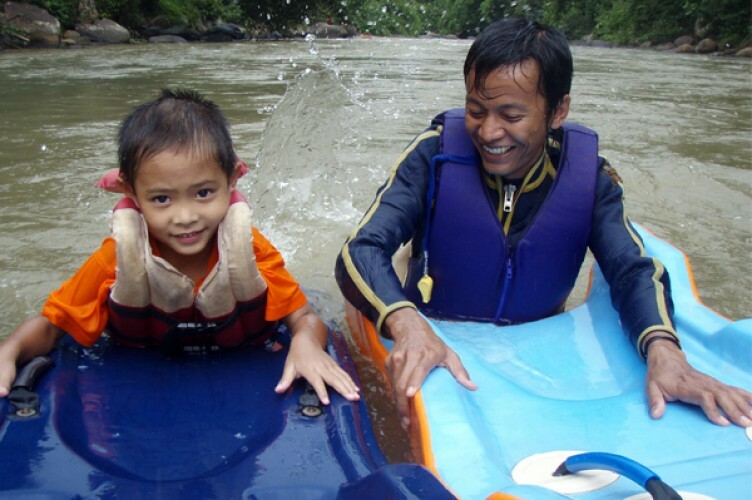 Share your camping experience at Bamboo Hill, Citarik River, Sukabumi with your family. This camping program is designed for all family members where you, your spouse and your children are able to experience the atmosphere of enchanting Sundanese countryside. In addition to strengthening family relationships, this camping program will introduce your children to the natural world. You and your family will learn about farming and other rural lifestyle and there are plenty of games to play! Experience a different river adventure with water rafting in Citarik River. Arus Liar (Wild Water) is an adventure tourism operator, specialized in rafting and outdoor management training packages since 1995. Enjoy another various adventures such as family camp that will leave a lasting impression in Citarik River and surroundings.